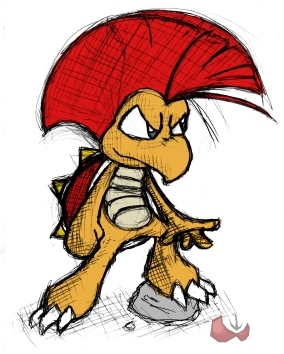 A Drawing of Omega Koopa by FuPoo. Discovering MFGG forums somewhere around September 2004, Omega K. was feeling awkward - it was the first forum he had ever gone to, He didn't know anyone, and was young. It seemed as if it was a chat board back then, with him not knowing anything. He gradually grew more familiar and improved rapidly. Omega decided to start acting mature and to focus on one skill: spriting. He remembers the first sprite he ever made, it got decent comments, but his sprites started to get worse and eventually had no appeal to them. Omega K. persevered through this and gained his way back up in the competition! Omega managed to get a few friends later on, around the time he started improving. Omega has no BEST friends, but can seem get along with anyone who he talks with on the board (almost). He contributes to discussions and gives decent C+C on others sprites and artwork. Omega has come along way when it comes to MFGG and has lots of 'adventures' too. He is never disappointed with what MFGG keeps coming back and hitting him with every day and night. As he eagerly awaits Smash Bros Brawl, Competitor, and Worms Open Warfare2, who knows what could be around the corner for him. One things for sure though - hes a true MFGGer by heart! This page was last edited on 29 April 2015, at 00:36.